If you are a REGISTERED member of the East Kent Branch Grenadier Guards Association, please also log into the "Branch Members Login" area of this website and see the messages intended for registered member’s eyes only. The Ministry of Defence (MoD) have launched (as of 18th February 2019) a new Veterans' ID card which will enable public and charitable sector services to instantly recognise the service of a Veteran. This card will provide proof that a Veteran has served in HM Armed Forces in line with the Government definition of a Veteran - which is one day’s service. Currently, there is no way for existing Veterans to easily prove the fact that they have served and the administrative burden on providers when verifying that a person is a Veteran can be considerable, both in time and cost. This card will allow you to confidentially verify that someone has served in the Armed Forces. Some genuine Veterans in need may not have the capacity to apply for one. Veterans should contact the Veterans' UK Helpline number for further relevant information. Their details are below. We Were Brothers in Arms is an attempt to understand the experience of battle during WW2 through the personal experiences of the ordinary soldier. Frank Clark has gathered together the amazing stories of British soldiers during the eleven months of frenzied warfare that followed D-Day, and combined them into this fascinating volume. As a veteran himself (serving in WW2, Korea, Malaya, Cyprus, Northern Ireland and during the Cold War), Frank is well versed in the adrenalin of battle, and here he brings together the tales of a wide cross section of fighting men on the front line. There are stories from the infantry, the assault troops who stormed the Normandy beaches and forced bridgeheads. The dashing reconnaissance men in their thin-skinned, tanks sending back vital radio reports; the parachutists, dropping behind enemy lines to fight, the sappers building bridges and clearing minefields under fire; the gunners, bringing down fast, furious and accurate barrages; the signallers, patching up communication links; the non-combatant stretcher-bearers, the doctors tending the wounded, the support services bringing up food and ammunition. This book tells their story of war, and reminds us why their sacrifice should never be forgotten. 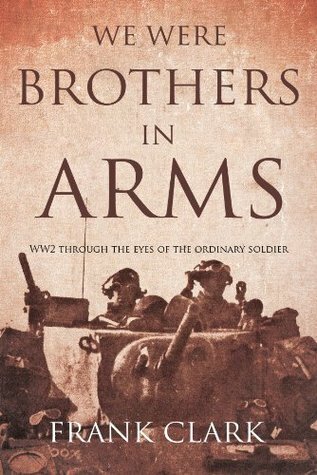 We Were Brothers in Arms is a compelling account of the last months of war told through eye witness accounts, some never before published. Frank has met all publishing costs, so by ordering though the East Kent Branch, RHQ or via the author (Frank Clark) will ensure that the full cost of the book is donated to The Colonel’s Fund Grenadier Guards (registered charity no. 1062257). Ordering via Amazon or the publisher of the book will mean only the profit going to the charity. The 1st Battalion Grenadier Guards returned from Afghanistan at the end of October 2012 after a grueling but highly successful operational tour. Sadly, 5 Grenadiers were killed in action and there were 46 battle casualties, of which 11 were amputees. A Victoria Cross was won but sadly posthumously. Such a grim toll shows only too clearly that the task of helping our Grenadiers is sadly only just beginning and we will need to continue to raise funds into the future. Your purchase of Frank's book will help raise much needed funds. To order a copy, please make contact with the East Kent Branch (via our Contact page) and we will provide detail on how to order. The latest book to be published by Lieutenant Colonel (Retd) RM Dorney MBE (one of our Vice Presidents) is available for purchase on the Amazon website. It should also be available in all good bookshops and many supermarkets. All profits from the sale of 'The Killing Zone' will be donated to The Colonels Fund Grenadier Guards and combat stress charities. The Killing Zone is a detailed and personal account, from ground level of the 1st Battalion, Grenadier Guards last tour of duty in Helmand province. To go to the Amazon purchase page CLICK HERE. Available in paperback and in Kindle versions. Please also tell your friends and family about the book and help make this a best seller.